fast in the Tunis medina! you get an Italian craving. 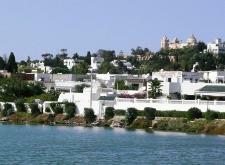 beautiful white-washed buildings; Hammamet; Sidi Bou Said (especially the sunset). from me; the Synagogue on Djerba being closed both times I tried to see it. sunset in Sidi Bou Said. of the fast each night during Ramadan. 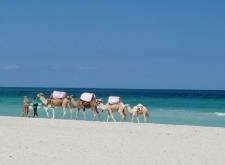 Smells: Sheesha; the sea; little flowers of jasmine being sold by men on the street. nearly everywhere; Hammamet medina which was so picturesque, it almost felt unreal; cats. faves); stuff squid (and it was one massive squid! ); Tunisian specialty sweets. Purchases: Silver necklace (8 dinars - what a bargain!). Street Food: Arabic sweets; baguettes; donuts. Things to Buy Here: Traditional caps for men; pottery; hookahs; pointy shoes; perfume oils. Western Companies Out Here: Benetton; there is a MAC store coming soon in Tunis. Type of currency? The Tunisian dinar. One dinar is equal to about $1.30 US. Religion: Muslim (although there is also Christianity and a small Jewish community). The view of Carthage from the port. Some of the Berber architecture in the desert.